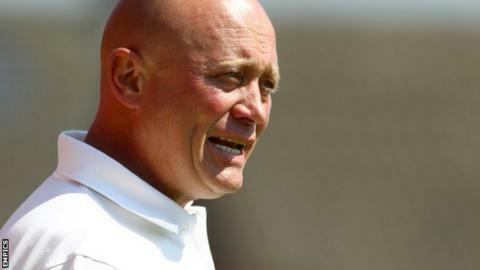 Alfreton Town manager Nicky Law says their fourth season is the Conference has been their most difficult to date. While the Reds ended a four-game losing run by beating Torquay 4-2 on Saturday, they remain second from bottom in England's fifth tier. Law, who took charge of Alfreton in 2007, guided a part-time squad to 11th place - their highest ever finish in the football pyramid - last season. "This season, for us, has been our toughest one," he told BBC Radio Derby. "We did ever so well last season, and the better you do, the more people expect. When you keep doing it against the odds, as we have done, sometimes it is a difficult act to live up to." Victory against Torquay was Alfreton's fourth this season. It was only the second time this term that the Reds have scored three or more goals. Law admits the six-game ban with which he started the season, having been hit with an improper conduct charge for an incident last term, is one of a number of factors which has contributed to their troubled start to the season. The club, which struggles to attract home crowds of more than 700, was put up for sale in April. "We've come in this year, we've had financial cuts, and my ban hasn't helped," Law said. But Saturday's win against a Gulls side that is among the favourites for promotion has boosted confidence. "We have not reached the heights of that performance so far this season - the finishing was of the highest order," continued Law. "The win shows that when we are at out best we can compete with the top teams. It's competing like that week in and week out that is the crucial and key thing."